Evils of camping . . . . . | Thirty Nine Year Old literary virgin! Evils of camping . . . . . The 3pm drive into the village was an hair-raising one to say the least, from the tight and even tighter 90 degree turns of the roads to the seemingly aimless sheep who, through some unfathomable sense of divine navigation, had decided to adorn the middle of the bending meandering B roads like fallen, unkempt clouds. With a few more turns, twists and titchy tiny hump backed bridges came the entrance to the campsite, or rather the gates to a darker, less favourable, outdoor living experience. The surroundings looked excellent, the canal – with its boats, yachts and barges – looked idyllic. Was this the holy grail of campsites? Had we found the Shangri-La of camping? And on my birthday too, this was the beginning of a successful year of travelling heaven . . . or so I thought, would all my hopes, wishes and dreams be dashed? I was only 300m from knowing the horrible truth. The smell . . . it was the eternal odour of decay, death and disease. The burning smells, the animal smells, the smouldering flesh from the barbeque smells, the stench was rank, it was all wrong, it was all right-now. Greeted by a dog, at least it appeared to be a dog. On closer inspection, it only had 3 legs, its left ear was missing and one good eye. It was and still is a dog of whose description escapes me – I am still shocked. It looked like its last meal would have been remains of Lucifer’s last supper. It hobbled around trying to follow our wallowing van into the second gates. The gates that signalled the last chance to get the hell out of there and to get out of they’re alive. Not that anyone would ever survive getting out of somewhere not alive or dead. The last few gear changes, the last few rotations of the wheels and turns of the steering wheel, revealed the gate master, the keeper of the camp-yards deepest and darkest secrets. She, the one who covets the gold and silver the weary travellers wish to part with for a piece of camping nirvana. “Herrrlllo” was the greeting from the withered lips below the crooked nose on her tarnished face. She couldn’t have been taller than 4 feet tall, slightly built with long brown scruffy hair. She didn’t have anything on here feet apart from dog mess and chicken droppings. Not the type of shoes you could find on the shelves of Barratts Shoes, wearing a brown cardigan that looked like it had been made from the pelt of the campsites previous dog – it smelled like it too. I couldn’t follow directly behind her; I had to follow just to the left with my head in the air to get a fresh breath to stop the stink building up on the inner walls of my nose. “It’s aaalllll gooooood” was her response, then she turned and walked away. With a building sense of dread, regret and tense nervousness I couldn’t shake – I left the security of the van and made my way to the doorway of the wooden shack from which all transactions were executed, for want of a better expression. Time seemed to expand, things outside looked to me as if they were being distorted, was this nerves? Was it some strange bend in evil time I was experiencing? Oh I wanted to be in my van again. Oh I wanted to be at another campsite. But I was here, I was going to survive, it wasn’t in my ever-crumbling nature to give in, to relent. “How much do I owe you?”, there was no turning back now, I had created the first bond with the demon, was she a demon? Or was she simply an innocent old lady trying to make a living and provide expectant travellers a warming place to stay in the wilderness? I don’t think so. She-shaman-demon-hose-beast would be more fitting. There was a cat, glaring, smelly striped feline of evil. I went to stroke it, it let out a screech, a noise so disturbing it could be used to signal the start to the end of all time. Maybe it was, maybe this was the last time I would be camping, living outdoors, experiencing any camper recreational bliss. I would soon find out. She-demon appeared from nowhere, “Fifteeeeen poouuunds!” she barked. I nearly jumped out of my, already crawling, undulating skin. While I was outlining my spiritual demise, she had summonsed the toll for my stay from the devils dowry. I handed her a crisp twenty-pound note, which I have acquired from the ATM in the previous village. Her eyes gazed upon it like it was some kind of extraterrestrial monetary offering. “Fiiiiive pooouuunds chaaaaange!” she had done her maths, she was from this planet, thank god– or was it a rouse? So many questions. I hardly had room in my brain for the sense I would need to survive this leg of my journey. I removed the five pounds change from her unwashed, wizened old hand quicker than a hare going round a dog track, she didn’t even see my hand move. I just wanted to get away from her before she turned me into a large, wet slimy toad. I didn’t even want to hang around long enough to check if the note was from this century or a darker time where paying the ferryman was as regular as the plague. With a final screech and scrawk from the cat and a final exhale of my own clean breath I left the cabin. “Theeere iiis yoooour pllllot” was the final banshee moan from the old woman as she pointed to a spidery-branched bush with an crushed orange traffic cone behind it. Why I heard “weeellllcommme to Saaallloms lllllot”, I do not know. Maybe it was the sounds that resembled the devils garden all around me, maybe it was the stares from all of the farm yard and domestic animals everywhere I turned, whichever it was it was nurturing the dark thoughts whirring around my head and they weren’t subsiding. “Are you happy with your site?”, before I’d reversed the van into the bumpy, potholed pitch, a voice from half-a-toyota-rav-four hollered. With a puzzled look on my face, “er . . . . its fine thanks, is this all yours” I replied, looking around and pointing at the grounds, animals, strange woman in the cabin and with nervous anticipation of any sort of recognisable response. “Yup, unfortunately!” looking as if he’s been landed with sorting out the national debt in an hour, “It’s all mine” Then he drove off towards the cluster of caravans and campers that adorned the entrance when I arrived. 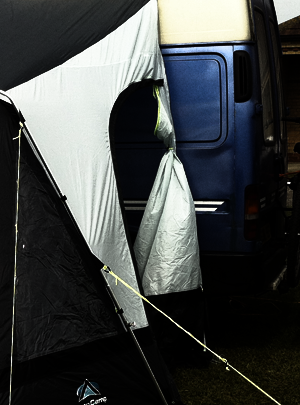 Without hesitation I climbed back in my van, turned the key and put it into gear. There was no measurable time between me getting the van going to actually being on the pitch with the electric hook-up plugged in and the doors of the van locked and me safe inside. I felt like a 12 year old after watching Jaws for the first time, I felt stupid. All this was in my head but yet the fear was still there, but still felt I should be hiding behind a sofa somewhere, not here facing this horror. I played the whole journey, to the shower block, over in my mind. Get out of the front door, drivers door. Lock it with the key that has “FB”on it. Be sure to have it ready. Have the shower block key in the other hand. Quickly open the van door, lock it behind me. Walk briskly to the shower block, making sure not to walk in an animal remains or droppings, get into the shower room, got to the loo, wash hands. Head down another brisk walk on the opposite direction to the van, get in, lock the door . . . . . safe and bloody well sound. What actually happened was; I fell out of the van, dropped the keys, walked into a pile of dog poo and tripped over the steps to the shower block. I couldn’t find the right shower room, no loo roll when I finally did, no soap, barely any water. Slightly stressed, I walked back to the van after a very satisfying pee – washed the dog poo from my shoes, got back in the van, crawled into my sleeping bag . . . .safe and bloody well sound . . . . until night time. It’s 8pm before I actually settle and stop peering out of the window to see if someone’s tampering with the van, the bikes or my sanity. The strange looking cluster of well-embedded caravans that welcomed me when I arrived are still active with the joys, merriment and ruckus of a teen party gone wrong, when will it end? The dogs are barking. Are they the beasts that call the demons to their nightly endeavours? It is now 11pm, the ducks are still squawking, the dogs are the still barking, the demons are still screaming and I am sitting in horrid anticipation of a night of debauchery and din and, honestly, I am shitting myself. Will I survive till morning? If this is my last line of text and I haven’t written anything else . . . . . then no, I was right and this was the hell site of all campsites, get my body out of here. I wrote this while sitting in my campervan on my birthday this year. It was an interesting time, to say the least.It is only a draft – a germ of an idea. Let me know what you think of my writing. I will use your comments to improve. Thank you in advance. § 4 Responses to Evils of camping . . . . .
First off you had me hooked at the title alone. I have a confession, I am not a happy camper! I have forced into it by well meaning friends a handful of times or less but each and every single time I felt as though I lost years off my life. As for the writing of it, that was fabulous. It brought such humour to camping hell! Hey Monica. I am really glad you like this. I thoroughly enjoyed writing it. I was inspired the moment I entered the camp site. I like dark humour. I need to write more. Thank you for taking the time to comment. You are currently reading Evils of camping . . . . . at Thirty Nine Year Old literary virgin!.